In his own way of saying “thank you” to Barack Obama for his expressed respect for Muslims on Al-Arabiya , President Ahmadinejad has an idea or two for the new American president…. Iranian President Mahmoud Ahmadinejad demanded on Wednesday that US President Barack Obama apologise for the “crimes” committed by the United States against Iran over the past 60 years. The hardline leader also called on Washington to withdraw its troops from across the world as a proof of Mr Obama’s commitment to change. “You were standing against the Iranian people in the past 60 years,” Mr Ahmadinejad said during an address in the western region of Khermenshah that was broadcast by state television. As to the troops, he said he expected two kinds of “deep and fundamental” change. 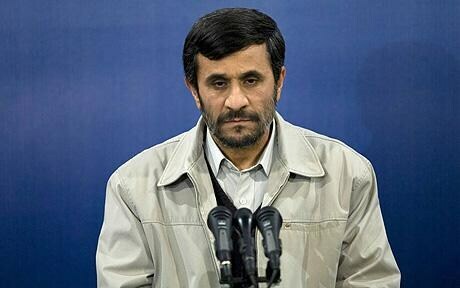 Mr Ahmadinejad said the advocates of change must “stop supporting the Zionists, outlaws and criminals”. He called on the United States to “stop interfering in other people’s affairs”. He also said the US government should “let the American people decide their own future … Stop pressuring them,” he added, without saying what he was referring to. Mr Ahmadinejad said he welcomed change but the “change has to be fundamental”. Iran Will Have Nuke This Year? You are currently browsing the archives for the Ahamadinejad category.